In truth, no one ever wins because no one ever changes their minds. Family dinner debates are like candied yams: Nobody really enjoys them, but they’re inevitable at Thanksgiving. And as for tonight’s dinner, it’s gotten a little bit cheaper over the past year. 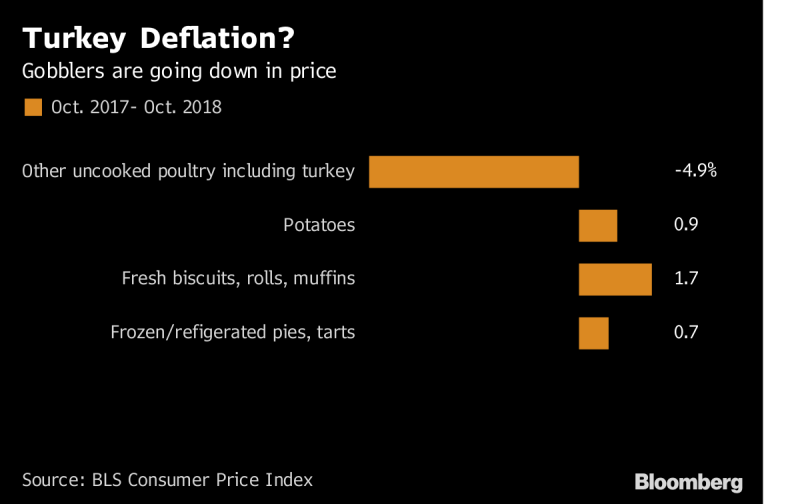 Turkey deflation—it’s a thing. While it’s true that prices are increasing at around 2 percent a year right now, economic policy makers aim for that kind of modest inflation. And as for tonight’s dinner, it’s gotten a little bit cheaper over the past year. Turkey deflation—it’s a thing. Your response: Simmer down, you two. Growth has indeed moved higher, helped by tax cuts and higher spending caps. There are nascent signs of more capital investment—one of the main goals of the Trump tax cuts. But business spending cooled recently, and data this week showed that durable goods orders slumped in October. The fiscal sugar high is expected to start wearing off in 2019, and those early signs suggest that it might have done little to nudge up the run-rate of the economy (though, to be fair, it's still too early to tell). One thing is clear as annual budget deficits approach $1 trillion: They’re already leaving the country more indebted. Your relative says: The Federal Reserve is getting a little aggressive with these rate hikes. Your relative says: The federal funds rate is going to rise above the upper limit on its target range, if the Fed’s Jay Powell isn’t careful.